What Bliss with a Paper & Pint! Ireland’s plethora of fine pubs offer many a rare delight, but to those in the know, the serenity & grandeur offered up by the ornately decorated ‘The Long Hall’ of George’s Street in Dublin city centre is something truly special. This is a dark, charming bar with a relaxing atmosphere at all times, excepting for the usual peak crowdedness of a Friday or Saturday night. If you are not already familiar with its fame around these parts, set yourself aside a Sunday afternoon, grab the newspaper and saunter on in, pull up a stool and order a pint of the black stuff or whatever your chosen poison may be. As daylight washes in, reflecting against leaded glass, mirrored shelving, old brown whiskey bottles or the brass-rimmed bar counter, the soft glow of the bar adds to the soothing tranquillity of this long, narrow oasis. This is a fine place to read bad news, if you really must. My favourite spot is to grab one of the seats to your right just inside the main door, nestled perfectly between the large front window with a clear view out to the busy street and the corner of the main bar counter, so you’re not too far from a top-up. Little has changed here since the Victorian-era refurbishment of deep-red ceilings, baroque mirrors and the long, timber counter you see today were completed back in the springtime of 1881 for then publican, Patrick Dolan. In fact, even pre-dating the bar that you see today, there have actually been licensed premises on this spot since 1766. In the period between 1766 and 1881, Henry Mailey ran a busy tavern here of a different guise in the 1830’s, Patrick Parker – Grocer & Wine Merchant – took over the pub in 1857, plus in the 1860’s, the pub was both a recruiting station and a meeting place for the Fenians and I.R.B. (Irish Republican Brotherhood). By 1898, William Fitzpatrick had taken over the bar from Patrick Dolan. With its red and white canopies out front and listed building status amid the surrounding modern office developments, The Long Hall is a landmark on George’s Street, as evocative of Victorian Dublin as the turret-topped George’s Street Arcade across the street from it, which is notable as Europe’s oldest shopping centre. 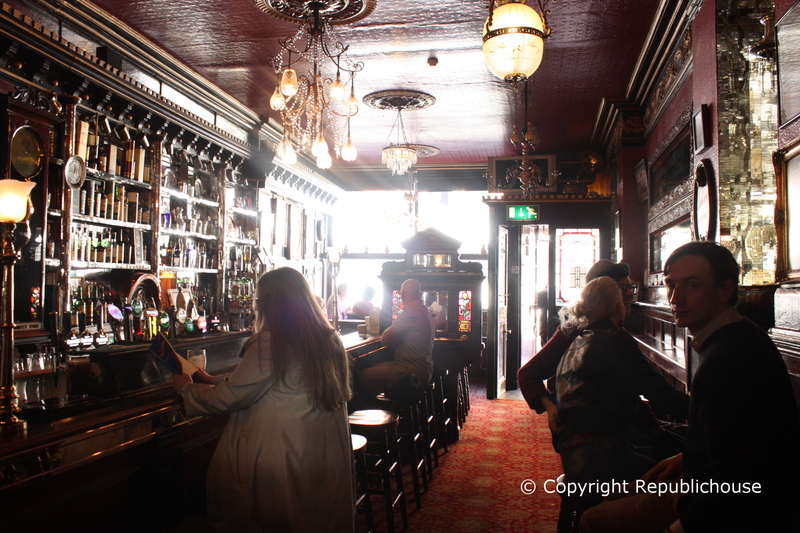 The pub’s elaborate interior matched the socially aspiring image of George’s Street in the 1880’s, as opposed to working class pubs such as Mulligan’s or Toner’s, popular in the same period (and still popular today I might add!). Here in perfect symmetry and detail is a bar replete with brass fittings, wooden partitions finished with gold-leaf carvings, glittering whiskey casks, gleaming chandeliers and and covered in rich red across walls, ceilings and carpets. The abundant brass ornamentation is cleaned and polished daily with good ol’ Brasso and elbow grease. Now there’s a chore that is deserving of a pint! In 1912, William Fitzpatrick added the large Wekler & Schlegel clock over the oval shaped entrance between the long front bar and the wide lounge bar to the rear. The clock creates the illusion of a Victorian train station. 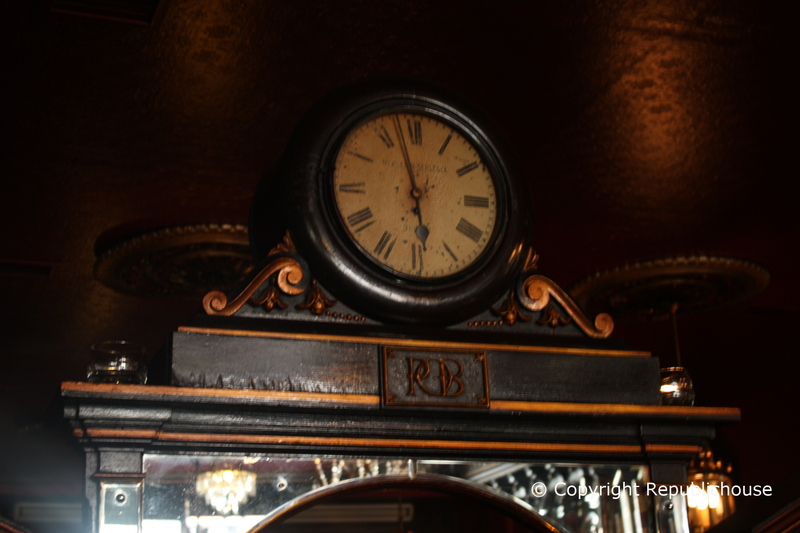 The initials ‘POB’ engraved in the wood panel below the clock point towards former charismatic publican Patrick O’Brien, who arrived here in 1941, who himself was succeeded by current owner, Gerald Vincent Houlihan in 1972. 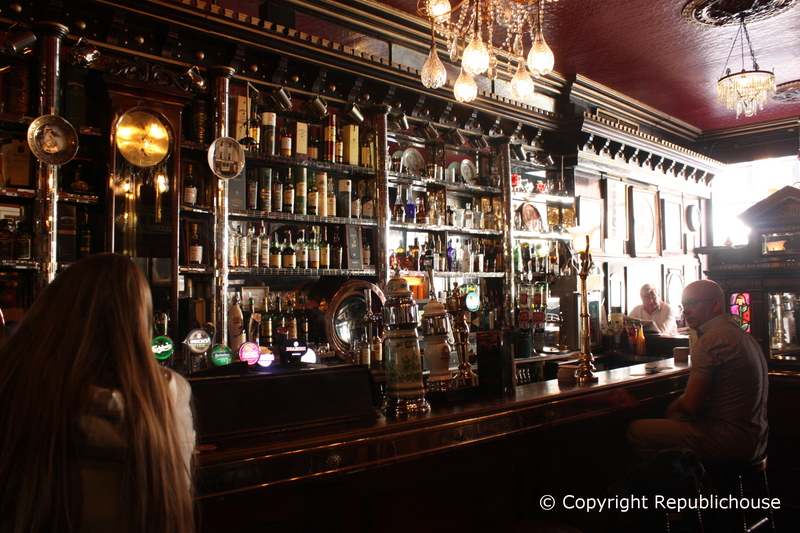 Today, Gerry’s son Marcus runs the pub and avidly maintains its Victorian splendour. The pub takes its name from a long hallway that once ran the entire length of the left-hand side of the building, and which acted as an elongated snug, but which is now gone. How ironic it is that a pub of such supreme preservation is bereft of the one feature to which its very name is in honour of. Only men were permitted to be served in the bar until 1951 albeit that women were entitled to be served via this makeshift ‘long hall’ snug. Over the years, poets, playwrights & politicians among others have added to the pub’s unique personality. Bad-boy writer Brendan Behan was a regular here in the mid twentieth century, unleashing many a sing-song back when publican Patrick O’Brien permitted singing. In more recent times, the pub has been a magnet for musicians and artistic types. In 1982, Phil Lynott recorded his video for the song ‘Old Town’, sitting as he did in reflective mood by the main bar counter. I must ask for Phil’s stool next time. The pub guards the privacy of many a famous regular to this day, not least Bruce Springsteen, who has made numerous visits to the pub over the years when touring in Ireland. Rihanna has dropped by too, but now I’m just shamelessly name-dropping. Expect to meet anyone from 20 to 90 years of age on your next visit, all suitably relaxed & talkative no doubt. Angelika & I have had many great occasions and visits to The Long Hall. It has played the role of a pit-stop in the midst of full-on nights out and equally a restful oasis of an early afternoon or weekday evening. 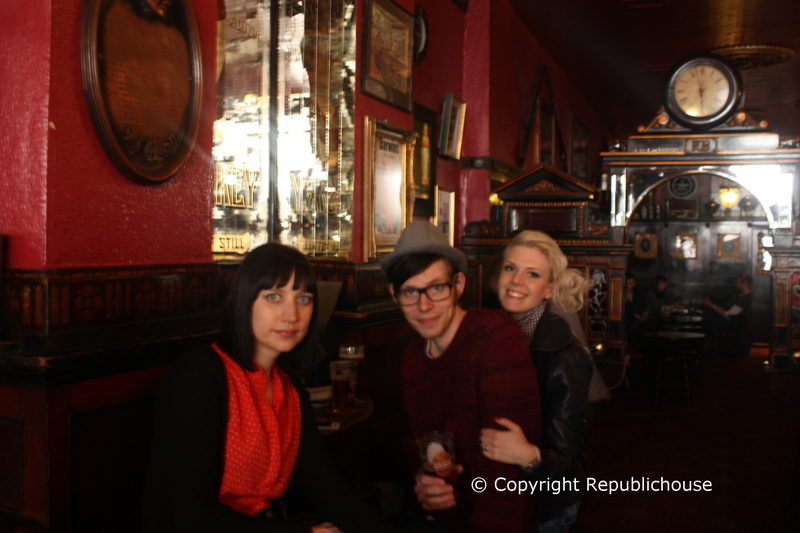 On this particular occasion, we dropped by with our friends Marie & Gabriel from Sweden who, like us, take real delight in enjoying a slice of pub-life from a bygone era. It was a sunny mid afternoon and we popped in for a couple of drinks while in the city centre. It was the perfect setting, with that calm atmosphere created from just a smattering of customers and with daylight cascading in, adding shine to the bar’s regal interior. We sat along the side stools just across from the main bar counter in the front bar and casually nursed a few pints, chatting away and enjoying the surroundings. It was somewhat remarkable to look through to the main drinking lounge at the rear and see it almost empty and in its full glory. We are so accustomed to being there of a weekend night, when the room is shoulder-to-shoulder busy, and its antique wood panelling and series of prints and portraits remain hidden. There is a T.V. back there although I must admit that I’ve never actually seen it turned on. I’m guessing that Ireland would need to get to the World Cup Final or there be reports of an alien invasion on the news for that to happen. Maybe the staff turn it on for Bruce Springsteen when he drops by, although I seriously doubt it; he’s just a regular. This pub is not for changing, and good god, it is all the better for it. Visit because: Step into this regal, Victorian-era bar, full of charm and unique interior decoration. Outside of the obvious busy periods, the atmosphere is warm and relaxing what with the restful clientèle and the soft lighting. The Guinness is top-notch. Despite its ornate interior there are ‘no frills’ in other ways; there are no matches shown on TV, no themed events, quizzes or live music but that’s the whole point. Drop by, you’ll see what I mean. Thank you for the ‘Like’ meditativedishwashing 🙂 Glad that you enjoyed. Enjoyed your post on Eugene, Oregon too! Sally, thank you for the ‘Like’; glad you enjoyed! Very cool. Will check this out in August when I’m in Dublin. Haven’t been there in a (very!) long time, so I’ve forgotten my old watering holes. Wise choice. 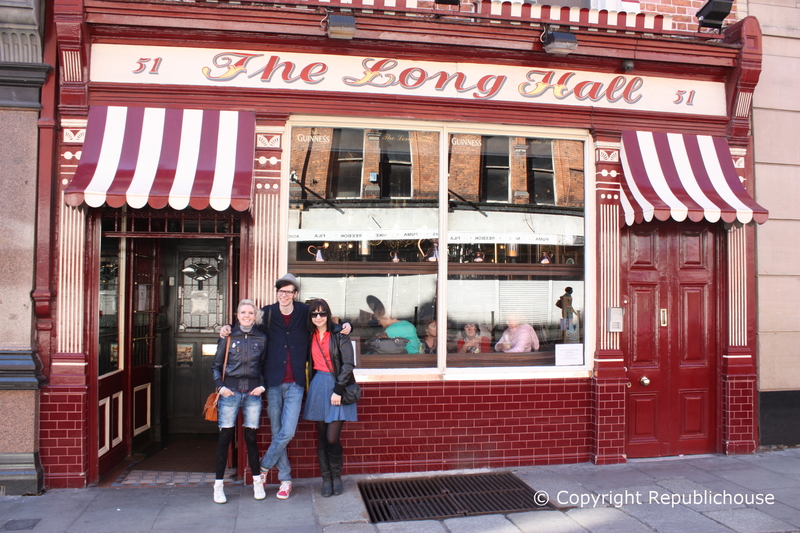 The Long Hall is a must for a rare Dublin pint. If you drop us a line, maybe we can meet for a pint! May check out Long Hall this week. If y’all can join us one evening between tonight and Wed., we will buy you that pint. Let us know if you are free, and which evening. Ignored my own advice and visited on a busy Saturday night, but needless to say, we still had a fantastic night! It helped that we had a great corner, right by the front window.